Espuma TST shop has won the Appreciation Awards in the 3rd Hong Kong Restaurant Interior Design Awards. We're so proud to announce that we are selected as one of the "My Favourite Café" of the U Food Award 2017. It is our honour to receive this prominent award for three consecutive years. Love to celebrate in style with a delicious cake? Here, Espuma is presenting a special birthday cake to match. 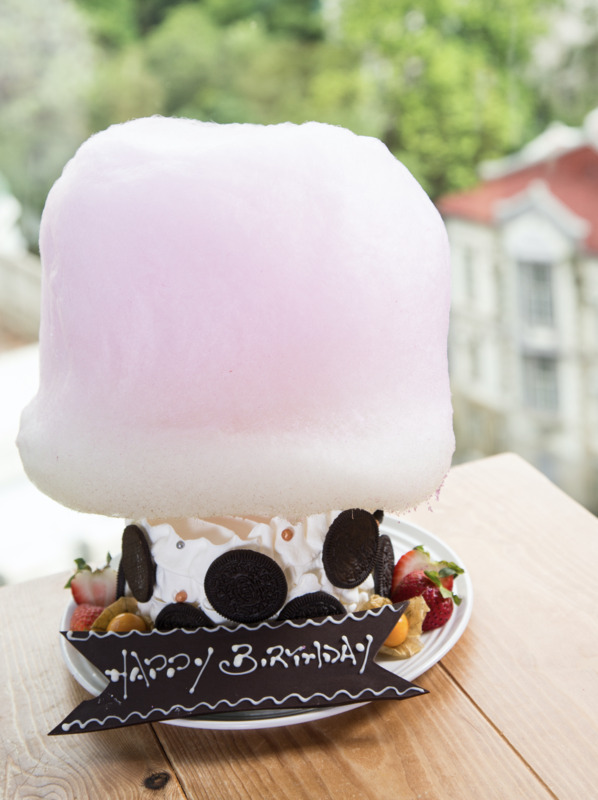 The birthday cake is priced at HK$158/1lb, there will be a special offer for VIP at 20% off. Remarks: Order 2 days in advance. From bean to cup, Novell delivers a truly Spanish experience. 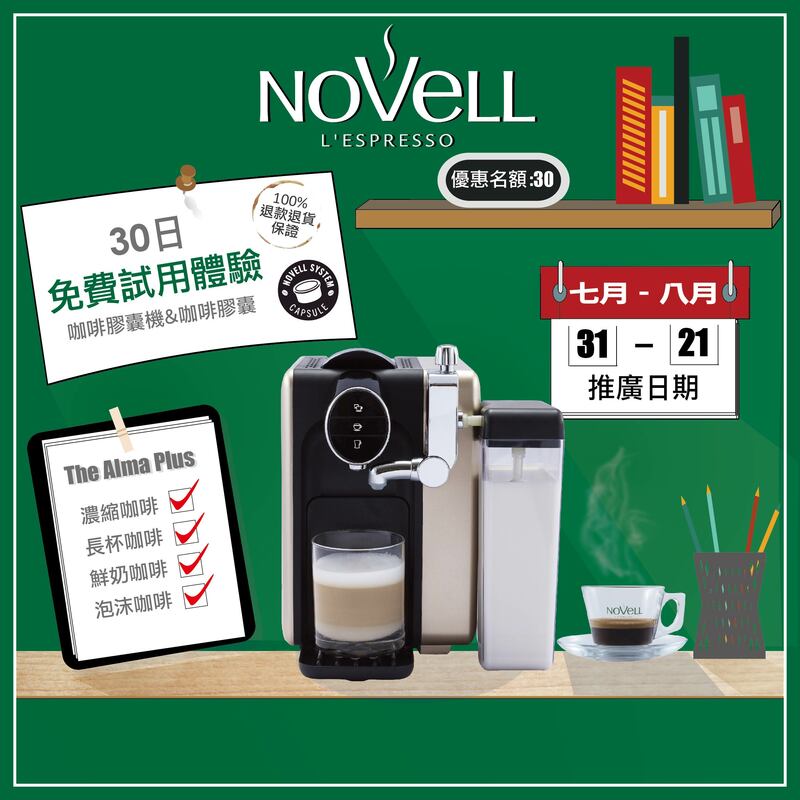 Starting from July 31, Novell has a special offer for all the coffee lovers. You can enjoy 30 days free trial of capsule machine and coffee capsules. Bring the coffee machine home and make different types of coffee at any time! Espuma is celebrating summer with a change of new Green Monday menu, where the new dishes will make you feeling light and refreshed. 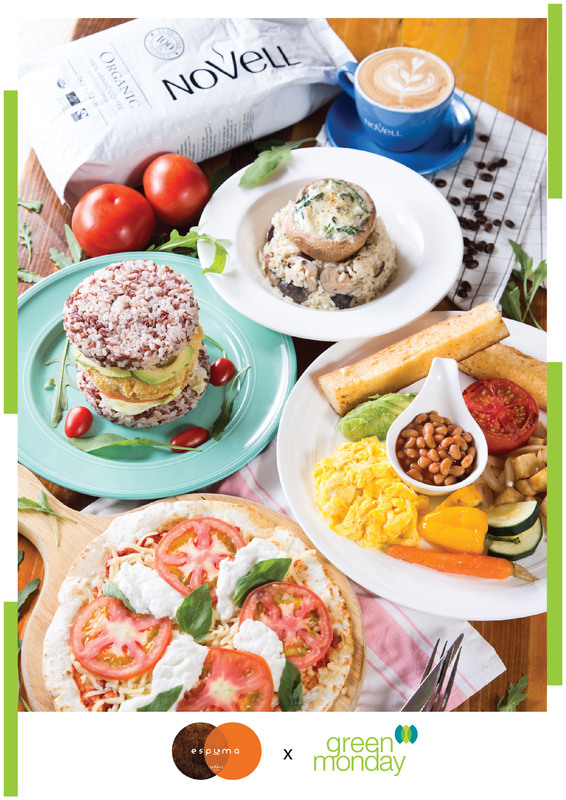 Highlighted dishes are “Vegan Burger Viva” and “Mushroom Enthusiast”. 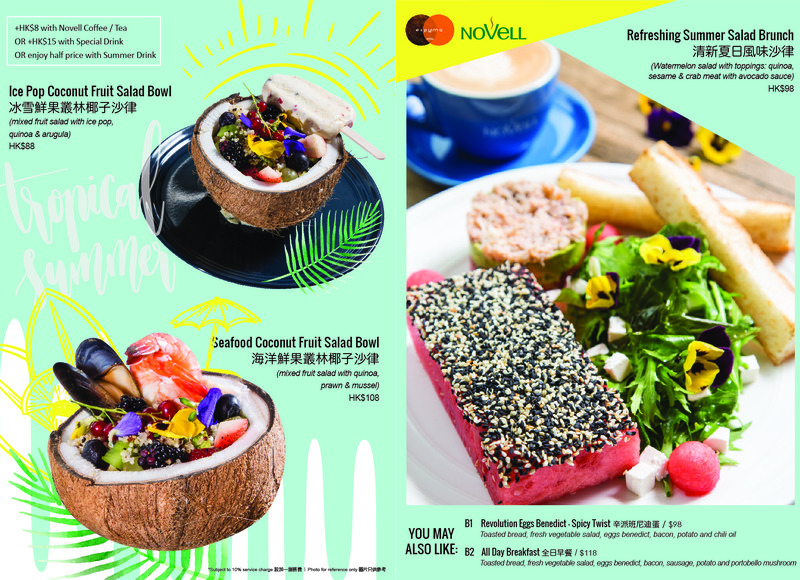 Additionally, guests can enjoy Novell Organic coffee to close the meal. Let’s stay Green, go for something healthy and light. Beach lovers have one more reason to rejoice this summer. 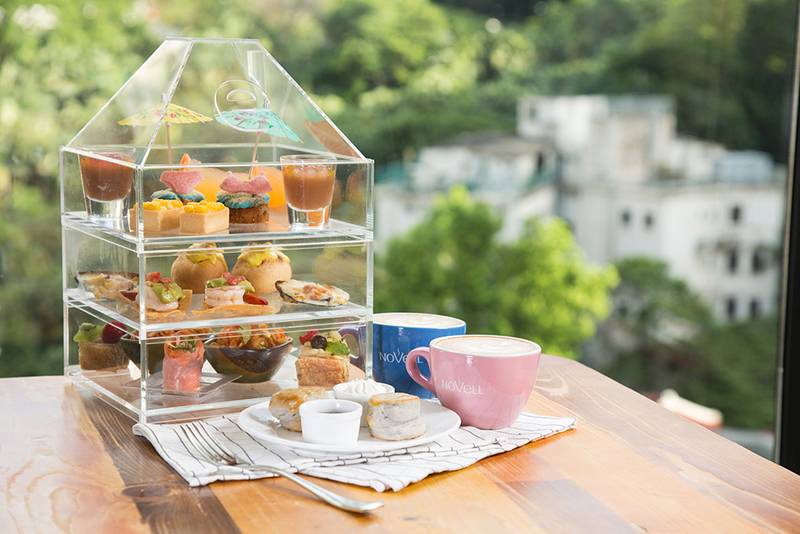 Espuma is launching a “renovated” afternoon tea set with ocean theme, where seafood, bikini, sun umbrella are presented in front of you while you’re enjoying your tea time with your friends. Let’s come and enjoy a leisure afternoon at Espuma. Available from July 24 onwards. Served between 2pm and 5:30pm. 2nd July, 2017. Please mark this Date on Your Calendar! What’s the big deal? It’s Espuma’s 3rd Anniversary. To celebrate this important date with everyone, we are now launching a special offer for you guys. Check it out! - 10% discount will be offered to HKID card holders with any 2 numbers of “7”, “0”, “2” & “3”. - 15% discount will be offered to HKID card holders with any 3 numbers of “7”, “0”, “2” & “3”. - 20% discount will be offered to HKID card holders with 4 numbers of “7”, “0”, “2” & “3”. - 25% discount will be offered to HKID card holders with 4 numbers of “7”, “0”, “2”, “3” & English name starts with “E”. ＊This offer is applicable to A La Carte menu only. Are you seeking an indulgence end to your meal? It’s true that dessert lovers always have the appetite for a mouth-watering dessert. 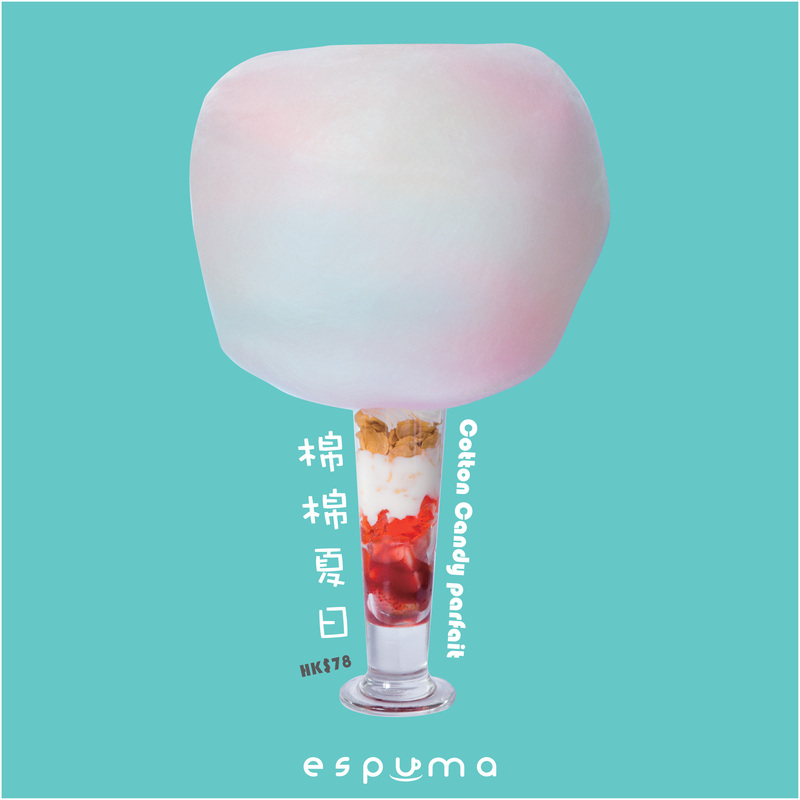 Espuma has created a “wow” dessert - Cotton Candy Parfait for diners to enjoy. 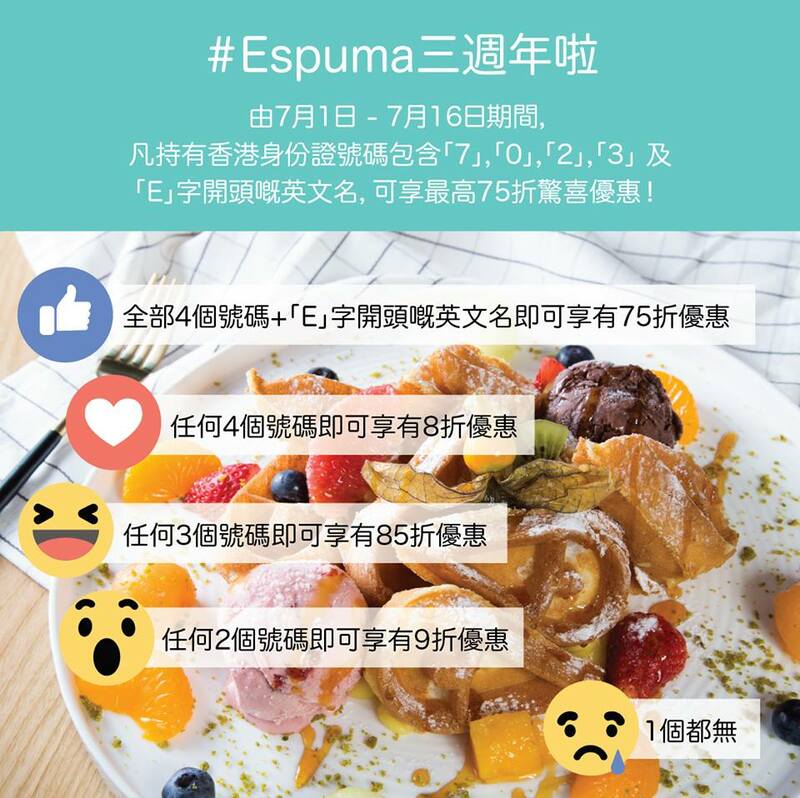 As the summer approaches, Espuma is launching an all-new and innovative brunch menu to beat the heat. Starting from 24th June. Available from Friday – Sunday. Summer is around the corner, the best cure for the heatwave is an ice-cold drink. 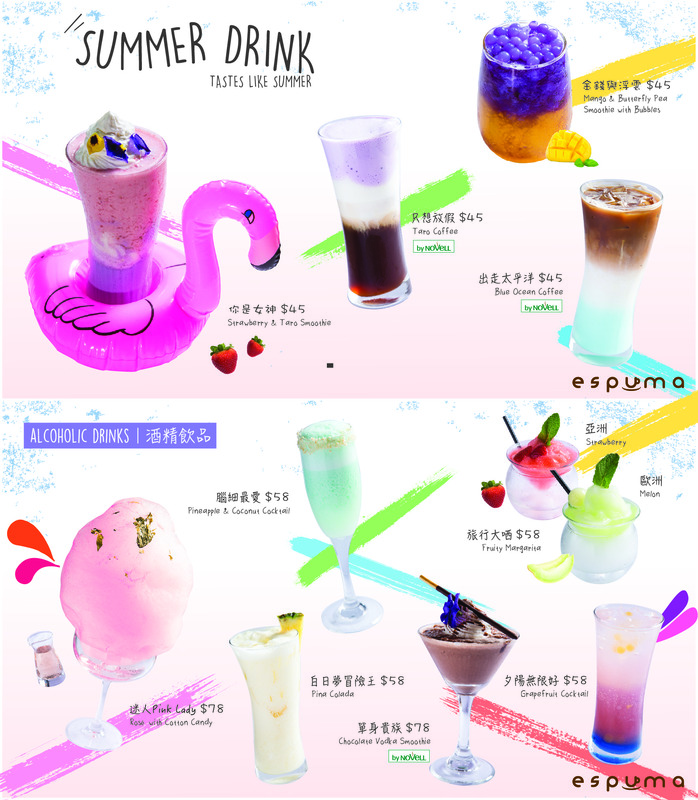 Visit us and try our new-series of summer drink.